Internet speed in the house. 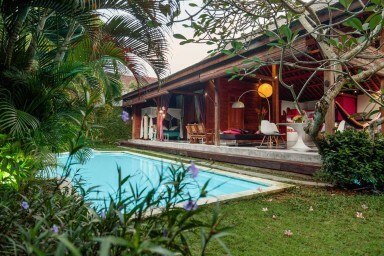 Villa Camini is the perfect choice if you’re looking for a stylish and photogenic two-bedroom villa in Kerobokan – an upmarket village perched between the hipster vibes of Canggu and the glitz and glamour of Seminyak. Made almost entirely out of wood, this villa oozes authentic charm and old-style colonial romance with its huge joglo-style roof and laid-back interior. The living and dining space is truly spectacular and has plenty of space for hanging out and relaxing, including two large sofas and a pair of comfortable arm chairs. One of the sofas also doubles up as an extra single bed. The living and dining space overlooks the lovely tropical garden and a private pool with sunbeds. The villa has two large bedrooms. The master bedroom has a king-size bed with mosquito net, air conditioning and an ensuite bathroom with a beautiful stone bathtub, toilet and a separate shower. The second bedroom is located in a private wooden outbuilding in the garden and is perfect if you want to wake up naturally to the sounds of nature. It also comes with a queen-size bed, mosquito net and a large outdoor bathroom with toilet and shower. There’s a lovely open-plan kitchen which is fully equipped with all mod cons and a worktop large enough to please any amateur (or real!) chef. We’d very much recommend you let our private chef take care of the cooking instead, so you can focus on fully enjoying your holiday. At an additional cost she’ll prepare you the most delicious daily breakfasts, lunches and/or dinners. She’ll also gladly throw in a little masterclass in Indonesian cooking – perfect if you want to impress the crowd back home. Speaking of which, our super-friendly and helpful villa staff simply love looking after you. They take great pride in making your stay as comfortable and luxurious as possible. Daily housekeeping and cleaning are of course included in the price – allowing you to simply sit back, relax and enjoy this beautiful island. Villa Camini comfortably sleeps five people if you include the single bed in the living room which can be rented at an additional fee. If you’re looking to accommodate a larger group, we can join this villa up with Villa Bumi next door and sleep an additional seven people. All in 1 just to say - perfect. Putu is the most handsome housemaid ever. THX THX THX. Greetings Roman & the Austrians! We'll be pleased to get in touch, feel free to contact us for any queries you might have.